COMING SOON: In October 2016, I’ll be in Florida speaking at a conference focused on the films of the Coen Brothers. Chances are I’ll make my way to your neighborhood one of these days, if I haven’t already. And I’d love to meet readers of Looking Closer, Through a Screen Darkly, and The Auralia Thread. “A Wild Horse on a Big Screen” – An examination of the artistry of Caroll Ballard’s 1979 film The Black Stallion. “An Ecstasy of Particulars” – What writing The Auralia Thread taught me about attentiveness, loss, and redemption. “Following The Auralia Thread” – Writing fantasy as a spiritual discipline of discovery. “Beyond Blockbusters: Entering the Mind of Contemplative Cinema” – A study of poetry in motion. “Through a Screen Darkly” – Lessons in faith and discernment from a life of dangerous moviegoing. “How to Chew Your Movies” – Lessons from my career as a film reviewer. “Beast and the Beauty” – Learning from traditions of magic, monsters, vampires, superheroes, and robots in storytelling. “The Eagles are Coming!” – Meditations on fairy tales, fantasy, and faith. Like a vampire, I can only show up when I’ve been invited. So send a detailed invitation to joverstreet@gmail.com, and we’ll see what’s possible. If you need more details, let me know. Here is my current calendar of speaking engagements. Now accepting invitations for lectures, readings, and teaching. Reading at Third Place Books in Seattle. I joined Dr. John Medina (author of Brain Rules), John Wilson (editor of Books and Culture), Julia Kasdorf (poet), Ashley Cleveland and Kenny Greenberg (musicians), and other special guests in this excellent weekend full of inspiration for writers of all kinds. I spoke on storytelling, the rewards of improvisational writing, and the benefits of self-inflicted obstructions. Saturday, September 1, 2012, 5 p.m. I had the privilege of teaching alongside Robert Siegel, a great poet whom I had admired for years, just a few months prior to his passing. I am so grateful for that experience. It was a privilege to accept my first Canadian invitation, and share my “Through a Screen Darkly” lecture with the community at Fire Exit Theater community and The Lantern church. At this conference on the theme “Be Generative,” I presented a lecture called “I Am Also Five”: sharing a life story about the generative power of play. March 24, 2011, 7 p.m. 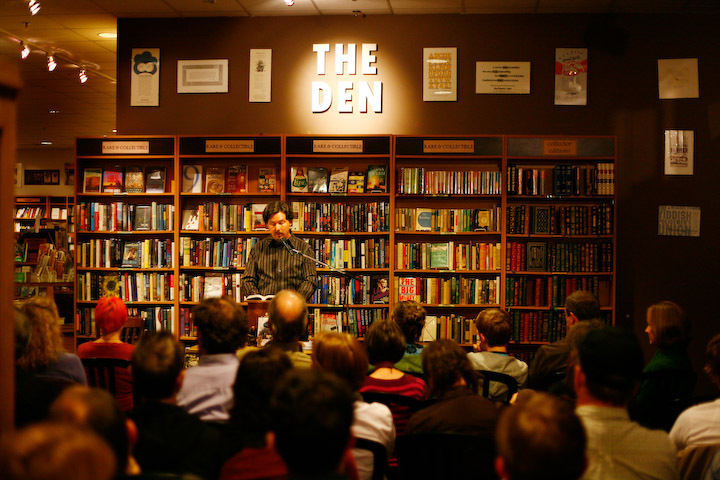 This excellent independent bookstore hosted the Seattle launch party for The Ale Boy’s Feast! I read from my new novel and reflected on the sixteen years of writing that brought The Auralia Thread to completion. 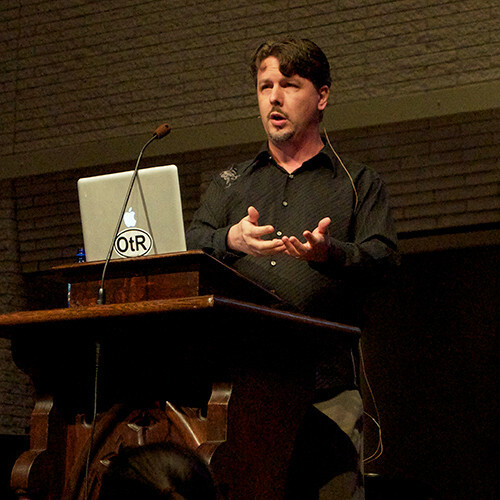 I spoke in a chapel assembly, and then presented my “Through a Screen Darkly” lecture at an evening event… even though laryngitis made me sound like Christian Bale’s Batman. Even though I was stricken with the worst laryngitis of my entire lifetime, I joined Elvis Mitchell, Ralph Winter, Robert K. Johnston, Gareth Higgins, Mark Pinsky, Claudia Puig, Justin Chang, and Carolyn Gordon to discuss “The Death of the Critic.” I survived, and had a grand time in spite of my illness. I spoke about film criticism to high school students in a media communications class, and then presented my “Through a Screen Darkly” lecture to students and parents at an evening event. I presented “Beast and the Beauty: A Tradition of Magic and Monsters,” celebrating the ways in which fairy tales, fantasy, and horror stories show us the truth through inspiring and discomforting revelations. I spoke about ways in which contemporary cinema can nourish our lives through encounters with the sacred, with beauty, and with mystery. I led a week-long seminar on cinema that exemplifies great art even as it investigates questions about the nature, purpose, and power of art. I spoke about faith, movies, and discernment. The question that the IAM folks gave me: “How shall we then tell stories?” I spoke about storytelling on the page and on the big screen. Watch Encounter 10: Jeffrey Overstreet on the how of storytelling from International Arts Movement on Vimeo. I spoke about movies, page-to-screen adaptations, hero stories, and more. I read from Raven’s Ladder and spoke about where The Auralia Thread would be going in the final volume. I read from Raven’s Ladder, talked about The Auralia Thread, and signed books. I led a week-long seminar on contemplative cinema. We looked at how the world’s most poetic filmmakers do what they do, and explored different avenues of discussion and personal interpretation. I offered a lecture called “Parable and Play: How to Write Stories Worth Reading More Than Once,” and I taught a weekend creative writing workshop for fiction writers.